When several major political figures die mysteriously, officials declare the deaths are from natural causes. Then the German Vice-Chancellor dies on the steps of 10 Downing Street and a drone is spotted hovering over the scene. The truth becomes clear - these high-profile deaths are well-constructed assassinations, and the Covert Eyes team is tasked to investigate. With the help of Dr Isabella Marin, a young expert in the enigmatic Voynich Manuscript and cryptophasia (twin language), Nicholas and Michaela home in on Roman Ardelean, a wealthy cybersecurity genius and a descendant of fifteenth century Romanian Vlad the Impaler - often romanticised as Dracula. Ardelean believes the Voynich Manuscript will unlock the secret to curing his severely ill twin brother’s blood disorder and is willing to murder anyone who gets in his way, including Nicholas and Michaela. With heart-pounding tension and gripping suspense, New York Times bestselling authors Catherine Coulter and J.T. Ellison 'are really on an amazing roll with their outstanding A Brit in the FBI series' (RT Book Reviews). What do falconry, computer programming, ISIS, hemophilia, LSD, evil twins, vampires, and drones have in common? They are a sampling of key points in this story. Coulter and Ellison stuffed a lot into this book and did well tying it all together although a few plot points did require heavy-duty suspension of belief. Interestingly, many of the different threads are based on real actions, things or events. The overall combination though, particularly the Voynich manuscript storyline, was a bit much. FBI agents Michaela 'Mike' Caine and Nicholas Drummond are in England visiting Nicholas's family when they get involved in the mysterious deaths of several prominent citizens. When a computer crisis hit and safe communications were compromised, it was interesting to see the old school methods they used both locally and internationally. It was a good reminder, again, of how dominant technology has become in our lives and how reliant we have become on it. The story was interesting with so much going on. There were multiple POVs but mostly they were Mike's, Nicholas's, and Roman's. We know going in that Roman is one of the villains but who else is at play and their motivations are revealed slowly. The action however was nearly nonstop. The mix of present day scenes and historical scenes was jarring at times and honestly most of the historical scenes could have easily been cut with no loss to the story. In fact, despite the action and the multiple threads, the story dragged at times. The print book is over 500 pages and they weren't all necessary. The story telling could have been tighter with a few of the threads cut out. As times, I had to check what book I was reading as Mike and Nicholas sounded exactly like Sherlock and Savich from Coulter's romantic suspense FBI Thriller series. Seriously, they were interchangeable at times; I couldn't tell the difference. Though, the romantic tension between Mike and Nicholas was light. Although they are both romantic and professional partners, the romance is mild to non-existent. 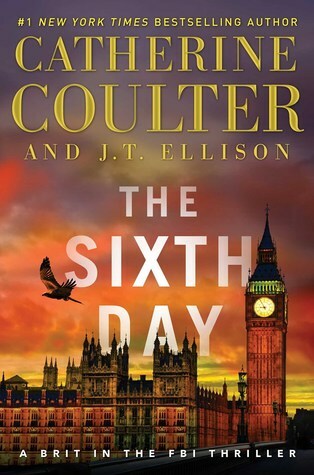 "The Sixth Day" was intriguingly plausible at times, unbelievable at other times, and too long but it was also interesting, intriguing, and full of action. It's a mostly fun escape from reality. Thanks Ro. I'm not a fan of her historicals but I love her American FBI series and I enjoy this one. This sounds like one that'd be fun in audio - I've found that helps with the too long feeling. I love J.T. Ellison but have never read Coulter. This looks like a fun read despite the flaw. It might be fun in audio. I like Coulter's FBI books, they are light and easy to read.